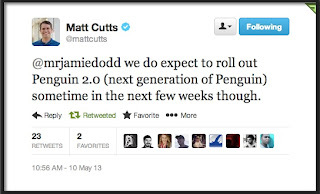 Google began pushing out the next generation of the Google Penguin webspam algorithm yesterday afternoon (May 22, 2013), and the push out is now finished. Around 2.3% of English-US queries affected, the change has also completed pushing out for other languages globally. The range of Penguin changes by language. For instance languages with more webspam will look more impact. 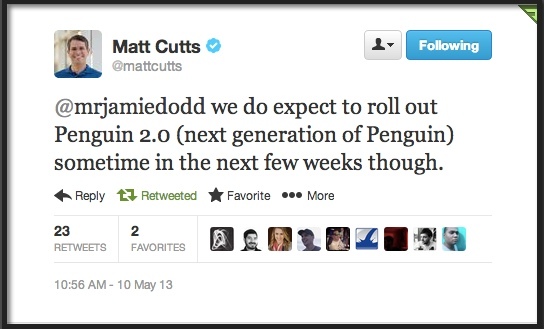 Now we called this fourth Penguin and its related launch Google has done, but that algorithm is an update (not just a data refresh) but the Google referring this change as Penguin 2.0 internally. If anyone want information on what SEO should expect in the upcoming months, then check out new video by Google.